Regulation, or REG, is one of the 4 CPA Exam sections you must pass in order to earn the Certified Public Accountant (CPA) certification. To prepare to pass the CPA REG exam, you must know all about the content, pass rates, questions, format, difficulty, structure, timing, and more. Thankfully, you can get all that information here so the process of defeating the REG CPA Exam section is faster and easier for you. As we can see in the REG CPA Exam Blueprints, the CPA REG exam focuses on federal taxation, business law, and business ethics. The CPA Exam dedicates an entire section to tax and business law because CPA candidates need a comprehensive and current understanding of these areas to fulfill the Certified Public Accountant position. So, no matter how you feel about tax, you must know all about the latest tax laws and regulations in order to pass the REG CPA Exam section. If you’re like me and tax isn’t your favorite, then you will have to bite the bullet with this part of the exam. But if you use your lack of tax love to stay motivated throughout your review, you can pass the first time like I did and minimize the amount of time you spend studying tax. You can also use all of this essential CPA REG exam information to start the process of passing. As you may know, the United States government signed the Tax Cuts and Jobs Act into law in December 2017. As a result, this bill enacted the most expansive tax law overhaul America has seen in over 30 years. REG is all about tax and allots anywhere from 55-85% of each exam to addressing federal taxation topics. Therefore, the REG CPA exam section started testing on the new tax law on January 1, 2019. Exactly how much of the tax law does the new bill affect? And that’s not all. As I said, these changes are uncharacteristically extensive. Generally, the AICPA adheres to the certain policies about testing new pronouncements on the CPA Exam. This table explains the times at which pronouncements become eligible for testing. Testing eligibility always begins at the later of the 2 times. Whenever a pronouncement becomes testable, the AICPA simultaneously adds the content related to the new pronouncement to the CPA Exam and removes the content related to the previous pronouncement. However, as the situation with the new tax law reveals and as review providers assert according to their experience, the AICPA does not hold hard and fast to these policies. The REG CPA Exam may ask you to use old tax forms or old research databases to answer a question. In this case, you should use the information the exam presents, even if you are aware of the current information. The most recent REG pass rate was a bit of a shocker. In Q3 of 2018, the REG pass rate broke the record with a figure .8% higher than the next highest REG pass rate, which was the Q2 2018 pass rate. All of the REG 2018 pass rates have been significantly higher than this section’s 2017 pass rates. In the last 12 years, the REG CPA Exam pass rate has taken some major twists and turns. But, most recently, it seems to be on the rise. This pass rate climbed steadily from 2006 to 2010 before plummeting in 2011. It then jumped back up to an average of 48% from 2012-2017. But in 2018, REG reached unprecedented pass rate numbers with the highest passing percentage in more than a decade. To assess your knowledge of the exam content, REG presents 2 different types of questions: multiple-choice and task-based simulations. Both types of questions account for 50% of your total score for the REG CPA Exam section. Question stem: the question stem contains the question being asked (usually found at the end of the stem), details necessary for answering the question, and extraneous information. Correct answer choice: the one answer choice of the 4 provided that best answers the question. 3 distractors: the other answer choices designed to distract you from the correct answer. Task-based simulations are abbreviated case studies that test your knowledge and skills in real work-related situations. TBSs ask you to use information found either in the question or in the exhibits provided to do something like performing a calculation, filling in a series of blanks, or revising a document. One specific type of TBS is the Document Review Simulation, which requires you to refer to various resources in order to assess a document. Another type is the Research task, which expects you to research authoritative literature and cite the appropriate guidance. REG is one of the 3 CPA Exam sections (along with AUD and FAR) in which you’ll see a Research task. Each section of the computerized CPA Exam consists of 5 testlets containing different types of exam questions. REG has 2 testlets of 76 total MCQs and 3 testlets of 8 total TBSs. The total number of questions for each CPA Exam section includes both operational and pretest questions. The operational questions count towards your score, but the pretest questions don’t. Instead, the AICPA uses the pretest questions to collect candidate performance data in order to decide if they will use those questions on future iterations of the exam. You can’t tell the difference between operational questions and pretest questions on the CPA Exam, so you should just answer all of the questions as well as you can. However, if you encounter a particularly challenging or unfamiliar question, you should give it your best shot, move on, and not worry because that may have been a pretest question that won’t affect your score. The CPA Exam’s purpose is ensuring you have the knowledge and skills necessary for CPA duties and represent the certification well. The AICPA defines the difficulty of each exam section by 4 different skill levels to accomplish this purpose. The REG CPA Exam section test candidates at 3 of these 4 skill levels. As you can see, REG tests the most at the Application level, so it doesn’t expect you to have the deepest understanding of most of the content. However, REG still has reason to be a hard exam section. It has the greatest number of MCQs (76) and ties with FAR for testing the most at Analysis, the second highest skill level. But considering its recent pass rates, REG currently is quite passable for both candidates who abhor tax and candidates who adore it. All 4 CPA Exam sections begin with 2 MCQ testlets, so the exam presents all MCQ testlets using a multistage adaptive delivery model. This big term basically means that your performance in the first MCQ testlet determines the difficulty level of the second MCQ testlet you receive. 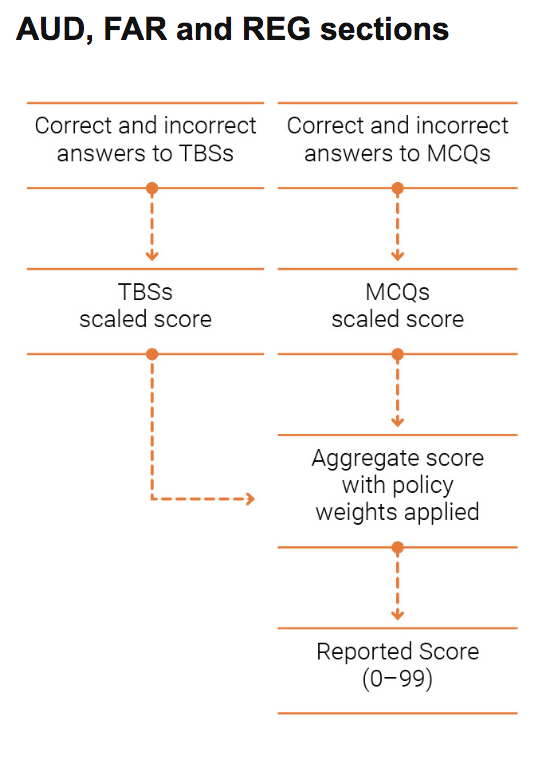 As you can see in this illustration, the first MCQ testlet you will receive, whether you’re sitting for REG or any other exam section, will always be moderately difficult (“medium”). If you perform well on this testlet, the second MCQ testlet will be slightly more difficult (“difficult”). Consequently, if you don’t perform very well, the second MCQ testlet will be moderately difficult (“medium”) again. The difficulty level of the testlets represents the average difficulty of the MCQs within the testlet. Furthermore, the difficulty level of the questions exists on a numeric scale; it’s not binary. The exam awards points based on difficulty level, so you get more credit for answering a difficult question correctly than an easier question. As a result, you aren’t penalized for receiving a more difficult MCQ testlet or advantaged for having 2 medium MCQ testlets. The difficulty levels of the TBSs are predetermined and therefore do not change according to your performance. However, for non-Research TBSs, you can receive partial credit for your work. Total testing time for the REG (and all the other exam sections) is 4 hours (240 minutes). However, the testing process will last 4 hours and 30 minutes. That’s because you will use 15 of those 30 minutes to complete additional testing screens at the beginning and end of the exam. Also, you can use the other 15 minutes to take a break that pauses the exam timer after the third testlet (first TBS testlet). As this illustration depicts, you can take optional breaks after the other testlets as well. However, the exam timer will continue to run during these breaks. Giving yourself enough time to answer every REG exam question is essential for maximizing your score and giving yourself the best chance to pass. Therefore, you need to develop, practice, and apply a REG CPA Exam time management system. If you give yourself a little more than 1 minute to answer each REG MCQ, you can finish the 2 MCQ testlets in less than 90 minutes. Then, you’ll have a little more than 150 minutes left for the 3 TBS testlets. At this point, you can divide that time according to TBS type. Conversely, you can simply give yourself 18 ¾ minutes per TBS. If you use 1 ¼ minutes to answer each MCQ, you’ll have 145 minutes for the 3 TBS testlets. There are 2 simulations in the first TBS testlet and 3 in the second and third TBS testlets. So, if you divide your remaining time evenly between the number of TBSs (8), you will have 36 minutes for the first TBS testlet and 54 minutes for the next. Additionally, following this system, you will have 1 or 2 minutes of extra time that you can use to review your answers throughout the exam. Based on these two time management system options, you can allot anywhere from 1 to 1 ¼ minutes to each MCQ. However, as you recall, the second MCQ testlet could be more difficult than the first depending on your performance. Consequently, you might want to give yourself 35-40 minutes for the first MCQ testlet and 50-55 minutes for the second. You would then have anywhere from 145-155 minutes left for the TBS testlets. You can adjust one of these as you prefer, but you must follow your time management system when you answer REG practice questions. Doing so allows you to refine your system prior to the exam and apply it easily on exam day. When the perfect time management system is second nature for you, you’ll be able to answer every question in the REG CPA Exam section. You can only sit for part of the CPA Exam, including the REG section, during the 4 annual testing windows. You also must pass all 4 CPA Exam sections in a rolling period of 18 months. Your 18-month window begins once you pass your first section, which means you have one and a half years to pass the remaining 3 sections. If you don’t pass the rest of the sections in this time, you will lose credit for the first section you passed. You must then pass that section again and the other sections you haven’t passed in 18 months from the time you passed your second section. If you don’t accomplish this, you will lose credit for your second passed section as well. The beginning of your 18-month window will continue to move back to the date of your earliest passed section until you pass all 4 sections in 18 months. Because the CPA REG exam covers so much tax, it may be the easiest or the hardest section for you. If you don’t have a lot of tax experience, then you may want to start with a section covering material you know more about. You could leave REG for later in your CPA Exam schedule so you can build your confidence with a few passed sections. On the other hand, if you believe you will need a lot of study time to prepare for REG, you might want to take the CPA REG exam first. That way, you don’t have to try to fit all of that study time into your 18-month window. According to my personal experience, feedback from candidates, and the recommendations of CPA review providers, total study time for the REG CPA Exam section can range from 80-120 hours. The more familiar you are with the REG exam content, the less you need to study and the faster you can pass. You can gauge your familiarity levels by analyzing the content areas of the REG CPA Exam Blueprints. To pass the CPA REG exam fast, you can study for 20 hours a week and finish your review in 4-6 weeks. If you can’t fit that much study time into your regular routine, you can study for 15 hours a week for 5-8 weeks. Studying for just 10 hours a week would require you to extend your REG review for 8-12 weeks. You can also do anything in between. How quickly you complete your REG review depends on how much time you have to study in a week. However, you must study regularly so you can retain the information and keep moving forward. Some people really have a problem with tax. In fact, I am one of them. Yes, I absolutely hated REG. But I managed to get an 84 because I hated it so much that I couldn’t imagine having a retake. 1. Bookend your study of taxation with a review of more preferable topics. Personally, I found business law and ethics to be easier (but still not easy) than tax. So, whenever I was done with a section on taxation, I would “treat” myself with a section of law or ethics. 2. Break up your study sessions with practice quizzes. It’s hard for me to concentrate on something I really don’t like. To mitigate this, I would break my studies up into smaller, more manageable sections by working on the practice quizzes and tests. 3. Don’t stress over low quiz scores in the beginning. At the beginning of your review, you might get most of the practice quiz questions wrong. That’s normal and fine. So, don’t worry about the numbers. Instead, keep testing yourself on your weak areas until the concepts really sink in. As you deepen your comprehension of the concepts and start to strengthen your weak areas, you’ll see those quiz scores rise. You’ll then have more confidence and be more energized to keep moving forward in your studies. On the other hand, if you enjoy taxation, lucky you! Now, you just have to focus on mastering business law and ethics. Don’t underestimate the ethics content. Some of my friends did and bombed the CPA REG exam because of it. Ethics can sometimes feel like a more subjective area and give candidates trouble. If your first few practice quizzes prove that ethics is a weak area for you, then the best approach is to take many, many practice quizzes until you understand the concepts inside and out. I can’t think of any other way to work on this besides repeated practice. Also, don’t forget to keep drilling yourself on troublesome topics. My strategy was to take quizzes with questions about my weaker areas at least twice so I knew that I really understood why I got those questions wrong. That’s how I steadily increased my score from the low 60s at the beginning to an 84 on the final exam. With all its focus on taxation, the CPA REG exam may not be the easiest for you. But you can still pass it, especially when you learn more about how to pass the CPA Exam from this site. I can tell you how to study effectively for exams and give you the CPA Exam tips you need to succeed. Most importantly, I can help you find the best CPA review course for you. Then, once you’ve chosen a course, use my CPA review discounts to save big your CPA Exam prep! I have purchased the ExamMatrix study guide and currently trying to get ready for REG. I’ve been out of school for a while. It is very time consuming. Thanks for the suggestions above. Any others?